On January 18, 2007, battle your way through the roads and rooftops of Crackdownâ„¢ as the explosive demo lands on Xbox LiveÂ® Marketplace. For the ultimate payback, combine forces in online co-op play for twice the thrills and double the retribution Gold membership needed for online multiplayer. 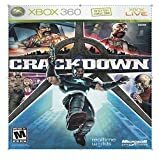 Arm yourself with high-tech weapons, transformable vehicles, and incredible, gravity-defying super-skills in preparation to take back Pacific City when Crackdown storms North American store shelves on February 20, 2007. This makes history simply because not many games outside of Dead Rising have figured out that having a demo available before your game lanches have seen the joys of what that pre-launch publicity can do for a title if the demo is awesome. Here’s hoping Crackdown continues this “Awesome demo, sell a ton of copies” record, because i’m definitely looking forward to this one.